Advice in this article is offered “as is”, and is based on our personal experience growing tomatoes and other vegetables. We assume no liability for the use (or misuse) of the products or techniques mentioned above. Before using any garden product, please read the instructions and review any harvest withholding or picking guidelines on the label carefully. Most products are best applied in the morning, especially if application involves wetting the foliage. Even seemingly innocuous “homemade” tonics or soap sprays have the potential to burn your plants if used when temperatures are high or during direct midday sun. Please use recommended dilution rates as per label instructions — more is not better and can damage your plants or be toxic to you. The most common and problematic diseases of tomato plants in Central and South Texas are foliar fungal diseases such as Early Blight and Septoria Leaf Spot. We also occasionally see some minor Bacterial Speck, but have not found that these usually prevent the possibility of obtaining a good harvest here. 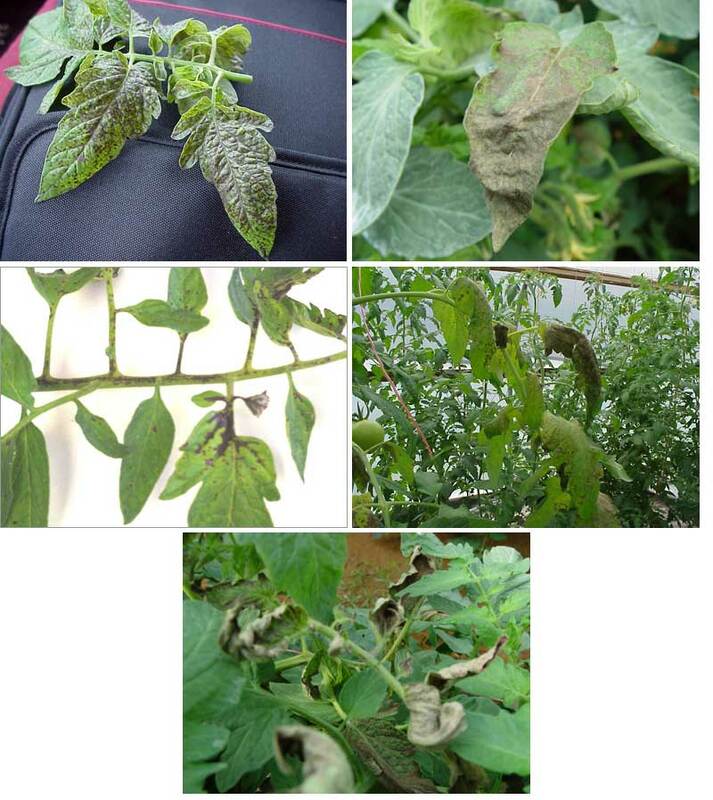 Heavy rains lead to a variety of fungal problems of tomato leaves and fruit, as pictured in the examples below. Good cultural practices, including mulching, removing diseased fruits/foliage, and frequent picking can cut down on the frequency of these problems. In the Carolinas, systemic fungal diseases such as Fusarium and Verticillium have reared their heads and present a far greater challenge. Early Blight, the most common fungal foliar disease, is spread by heavy rains and encouraged by persistent humidity. Remove significantly affected foliage on a semi-weekly basis. 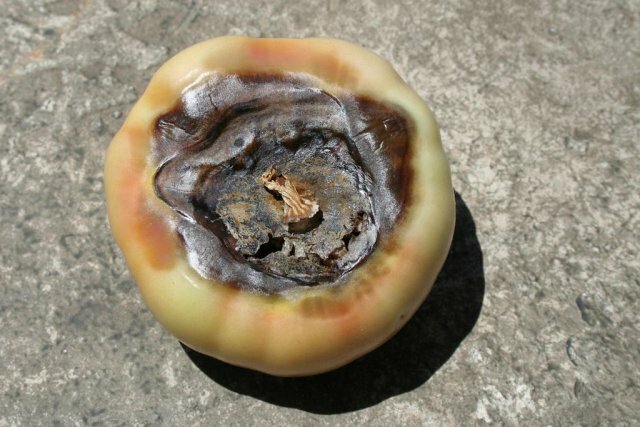 Anthracnose fruit rot affects tomatoes, peppers, strawberries, etc. Unfortunately it is nearly undetectable when tomato fruit are green, only to be revealed on ripening fruit. 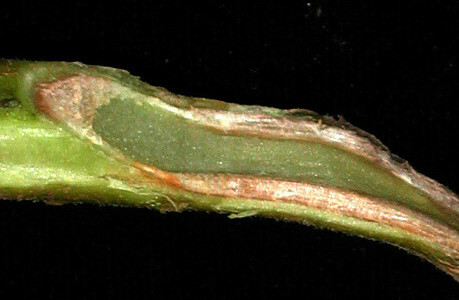 Anthracnose tends to be spread by soil splashback due to rain. Apply a fungal preventative on a regular schedule, and maintain several inches of mulch. Root Knot Nematodes (pictured left) can occasionally be a problem, especially for those with sandy soil. Nematodes cause root galling and affect the ability of the roots to uptake water and nutrients. Signs of a nematode infestation are visible bumps (galls) on the roots, wilting, yellowing of leaves, and stunted plants. Commonly suggested methods to control nematodes include planting cover crops of elbon rye, marigolds, or brassicas, but results vary. Amending the soil with lots of organic matter may also help, as well as rotating crops. Solutions: Some folks are getting good to great results by pretreating planting areas using mustard based products such as Dazitol, or even by just working some mustard powder into the planting hole when setting out their transplants. If you have problems with nematodes, yet another option is to grow in containers. Actinovate might also be worth a try, and there is some anecdotal evidence out there to suggest that it might help to create a favorable environment for the roots to thrive and resist RKN. Adding sugar or molasses to the planting hole can also help. If you are willing to limit yourself to specific tomato varieties, look for Nematode tolerant varieties denoted by a “N” following the variety name in the catalog or on a plant tag description. We have found that many N tolerant varieties aren’t the most flavorful, but some we enjoy include Sun Gold, Better Boy, Sweet Quartz, Mortgage Lifter VFN, and Momotaro — just to name a few. Note: Tolerance does not mean complete resistance. If the infestation is severe, even N tolerant plants will eventually succumb, but it can buy you some time — perhaps enough time to get a good harvest. 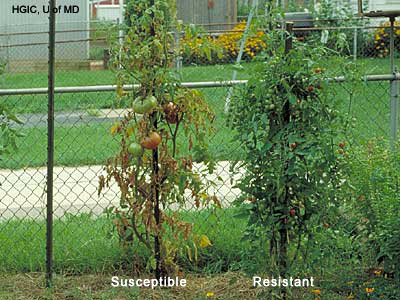 Tomato Spotted Wilt Virus (TSWV) is a devastating tomato disease affecting a large swath of the United States. TSWV is transmitted to tomato plants via small insects called thrips. Methods to minimize the possibility of TSWV include keeping weeds mowed and avoiding plantings of known host plants close to your garden. Specifically, be aware that marigolds are a common ornamental host plant for thrips (and spider mites), even though this goes somewhat against old garden lore that suggests marigolds are a good “companion” plant for tomatoes. Fusarium and Verticillium wilts are systemic fungal diseases and are not typically seen in Texas but are a significant problem in parts of the Carolinas. These diseases are present in the soil and infect plants via the root system. Spores can travel hundreds of miles via rain or wind. Plants slowly succumb, with the entire plant eventually turning yellow and failing to thrive. Treatment options tend to be limited for both of these fungal wilts. The telltale sign of these soilborne fungal wilts are the stem. When cut and placed in water, the stem oozes a gelatinous substance. On cross section, it may also exhibit brown discoloration. 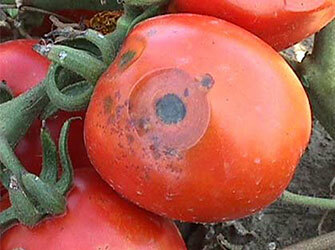 Blossom End Rot is one of the most commonly reported issues in tomato growing but is not actually a disease. Instead, BER is a physiological disruption of nutrient uptake, specifically a lack of calcium present in the developing fruit. However the addition of calcium to the soil (particularly the wive’s tale of adding egg shells to the planting hole) or various anti-BER sprays are not nearly as effective as solving the underlying problem. 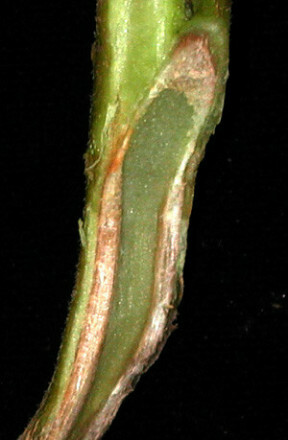 Blossom End Rot tends to appear in gardens that experience uneven watering. We recommend soaker hoses and a thick application of mulch to reduce dry-wet swings between waterings. Paste type and plum shaped tomato varieties are especially prone to BER even for plants whose moisture is meticulously monitored. Fortunately, BER tends to go away by itself later in the season. We have found that the application of Dolomitic (not hydrated) lime to the planting hole can also be helpful. If in doubt, have a soil test done by your County Extension Service. 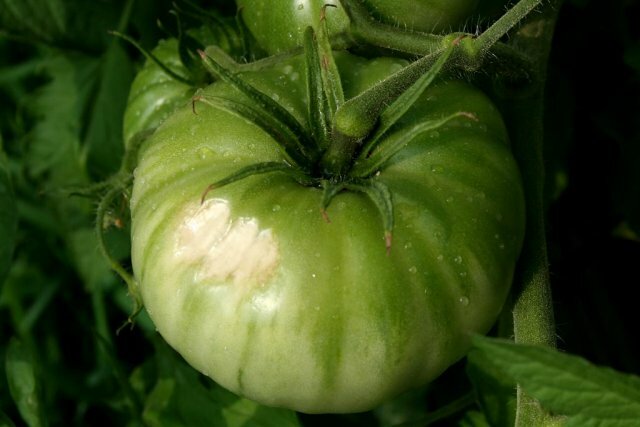 Sunscald is damage to the tomato epidermis caused by excessive sunlight exposure. It generally only appears when plants are defoliated through overzealous pruning, or the necessary removal of diseased foliage. If Sunscald is a concern, Surround can be mixed and applied to plants and fruit to reduce sunlight penetration. Watering — Water plants in the morning or early afternoon whenever possible, and water the soil, not the foliage. Do not be tempted to overwater. Water deeply and infrequently from the very beginning to train your plants, as this will tend to cause them to drive their roots deep (to seek water), which will lead to healthier plants that are better able to fight off various stresses. We generally prefer to water our plants no more than once every 3-4 days or so, even during the worst drought weather and hot temps. Soaker hoses or drip tubing (Netafim, for example) are our preferred method of watering plants. Location — If at all possible, site your plants where they get good early morning sun so that foliage dries out quickly from any accumulation of overnight rain or morning dew. Mulch — Mulching can help in limiting splashback of fungal spores onto the foliage from the soil. It can also assist you in your efforts to water deeply and infrequently as a layer of mulch will significantly cut down on evaporation. Just be careful not to pile up too much mulch right up next to the stem — be sure to leave a gap of an inch or two to avoid stem rot. Several inches of pine or wheat straw, coastal hay, shredded black-and-white newspaper, shredded leaves, and untreated pine bark are possible mulch choices. Ideally, install your soaker hoses first, then put mulch on top of them to keep any wetting of the bottom foliage to a minimum. Spacing — Space plants 24″ to 36″ apart for proper airflow. This will tend to limit the chances of disease from spreading from plant-to-plant and will also avoid areas of dense foliage between plants where insects may hide. 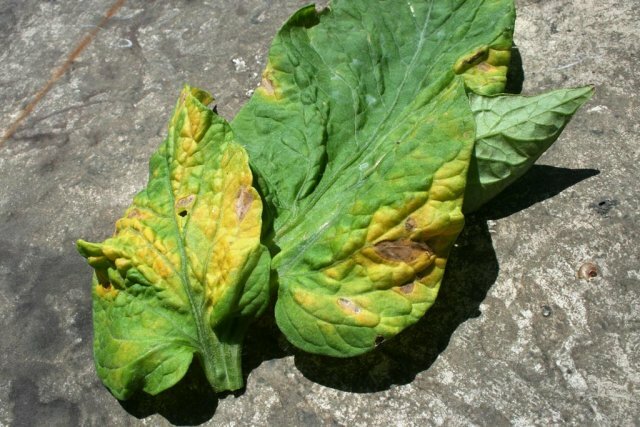 Removing diseased foliage — Remove and dispose of diseased foliage on your plants periodically to minimize the possibility of fungal disease spreading to the rest of your plants. Do not add diseased foliage to compost piles. Selective Pruning — There is a lot of advice out there on pruning and “suckering” to reduce the foliage on a tomato plant to a “main leader”. We do not subscribe to these approaches, however we do believe in cleanup of dense thickets of foliage, as well as any foliage which may touch the ground. After 3-4 weeks of growth and plants have reached 36″ tall, we make it a habit of cleaning up the bottom 12″ inches of foliage. This can be helpful in allowing the plants to dry out more quickly after rains and morning dew. If plants become extremely cramped in their cages to the point that good airflow is inhibited, some light thinning of the foliage is recommended. Otherwise, we have found that it is wise to leave most of the foliage on for both maximum photosynthesis and protection of the fruits from sunscald. Preventative spraying — From the day of planting out, and then frequently in the early season, we treat plants with Daconil (chlorothalonil) or another fungal preventative to help the plants get off to a good start and “reach a critical mass”. Later in the season, we are less likely to continue spraying plants, especially if they look healthy after significant fruit set has been achieved. In a particularly wet year, application is more frequent compared to a year lacking in rainfall. Daconil is a non-systemic fungicide that coats the foliage in order to limit fungal spore attachment. 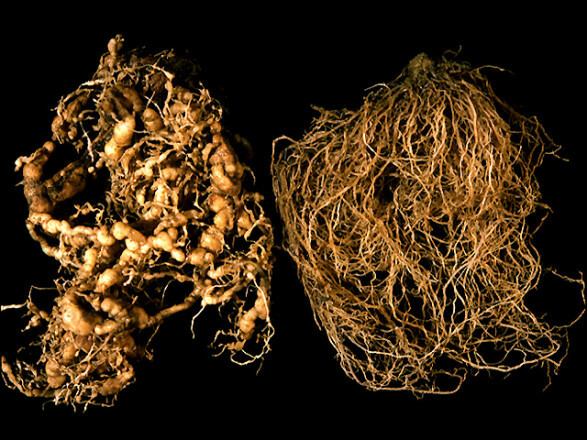 Daconil is not a cure-all, and will not reverse existing disease present on foliage. It is best used as a preventative from the get-go, applied early and regularly, if at all. Daconil can usually be found at most box stores or gardening centers labeled as either Ortho Garden Disease Control or Daconil in a 29.6% concentration. Mix up small batches following the instructions. Pre-mixed spray bottles of Daconil have poor application and are not cost effective if you are growing more than a couple of plants. Actinovate is an organic alternative to Daconil for fungal disease prevention and control. I’ve found it works fairly well if used regularly and early, but is not as effective as Daconil.